Why is it that negative spin always seem to stick longer then positive feedback? Lotus Notes has been here for over 20 years and it’s still going strong! How often do you hear of Lotus environments being hacked? Or applications rendered completely useless after an upgrade?? Lotus notes is as strong and vibrant as always and we know it (heck, we LOVE it!) now let’s tell the world! Site started by a conglomerate of Dutch IBM Business Partners (in Dutch) trying to get the positive vibe of Lotus products out there. 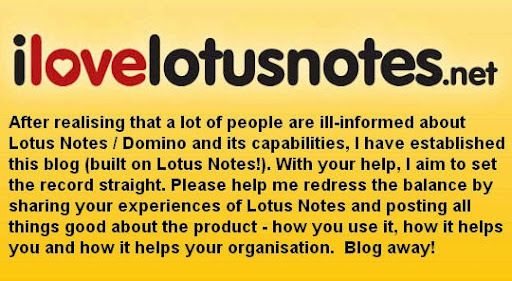 Nice site (English) where everyone can share his/her love for Lotus Notes. Is this a joke? I may be biased, since I found this site while looking for a decent Lotus Notes Hate blog, but what drove me to my mania was the fact that Lotus Notes does not work, and neither does IBMs help/remedy team. Perhaps if you work for IBM you could mention that in your post, so that readers know why you have such a positive Outlook (pun intended).